Today is Tintin creator Georges Remié’s (Hergé) birthday. We all know the boy detective and his gang are a big deal in Kolkata. You will find Tintinologists in every paara. have chalked out places you can celebrate at. If like all Tintinologists you are dangerously partial to Tintin merchandise, head out to the India Hobby Centre. A unique toyshop that was founded in 1954, it has a collection of carefully chosen items that will delight children and adults alike. The Hobby Centre had many more outlets in cities like Mumbai, Bengaluru, Delhi, Chennai, and Hyderabad. All of these have closed down, the branch here is the last remaining one. Read more about it here. Chill out at Kolkata’s first travel cafe with some heat-defying drinks and salads and shakes. Step inside, look up and you will see a colorful world map on the ceiling and running around the rim are figures from Tintin comics ostensibly to get to point X — which is Travelistan. “There’s no traveller as big as Tintin, right?” laughs owner Paramita Gain. Get your fix of Tintin at a store called Smile in New Market. 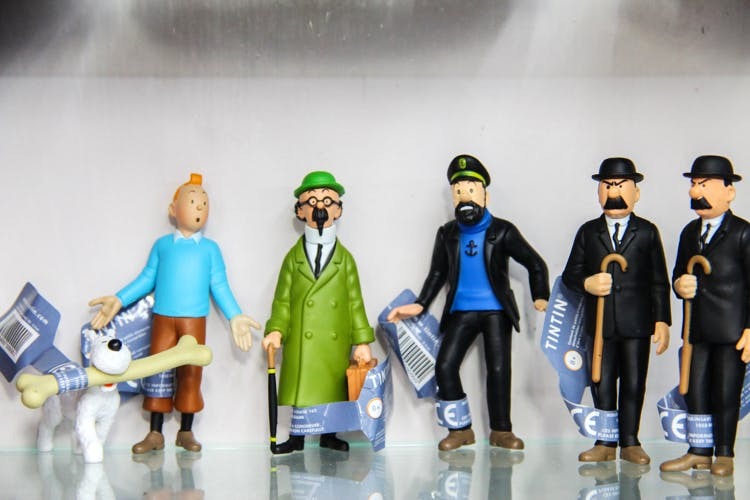 We absolutely fell in love with these figures of all the main characters from the Tintin books (including Snowy with a huge bone). The set is for INR 4.500, but you can also buy just the blessed twins for INR 2,000. A Tintin comic takes its automobiles very seriously indeed. If you are a Tintin fan, you’d know that many of the stories feature car chases. We loved the collection of Tintin cars at Smile (INR 3,500+). These are faithful recreations that reflect actual cars complete with characters sitting in them (they look like freeze frames from the comics). On an aside – Tintin creator Georges Remi (who wrote under the pen name Hergé – the French pronunciation of his initials reversed), was an avid driver and a collector who peppered his work with an array of precisely-rendered cars spanning the 47 years during which he drew the books! More about the store here. Head out to Tintin & The Brussels Club, a themed eatery in Hindustan Park near Azad Hind Dhaba and Wise Owl cafe. Look out for the lit-up cutout of Tintin and Snowy. Take a selfie with the many covers of the comics and sketches of characters that dot the walls. The menu is largely continental in keeping with the Brussels theme. We all know how much Tintin means to Bengalis! Generatiosn of young readers have been brought up on the adventures of Tintin. Even Satyajit Ray has made references to Tintin, specially in his Feluda books. If you watch the Feluda film Jai Baba Felunath, you will see that the crime is resolved when they see the cover of The Broken Ear. Tintin is so popular that people here have created comics showing the detective and his gang solving crime on Kolkata streets. In 2014, Trinamool had actually used Tintin in their campaign for votes! Read about it here. Check out these images here, here and here. And finally, do pick up some more Tintin books (if you haven’t enough already!). Put up your feet and savour the racy plots with mad scientists, lost jewels, sea adventures in shark-finned submarines, rockets to the moon and more!